Are designer pigs worth the money? Brady Lowe of Cochon 555 breaks down the difference between dry, bland chops and fancy swine to help you decide. For most of my life, I could not understand the hype over pork. But thanks to the recent renaissance of heritage-breed farming, the “other white meat” has made a comeback. Menus at top restaurants list pigs that sound like old English aristocrats, and the furry face of Mangalitsa has enchanted editors at nearly every major food magazine, gaining a reputation as the “it” pig of the moment. But when most people go to the deli and find pork priced at $24 a pound, they start wondering whether it’s really worth the extra money. For the most part, what “heritage-breed” means exactly is still unclear. However, if you put the stiff mauve-colored pork chops from the supermarket meat aisle alongside the rich, marbled ones from Gloucestershire Old Spots, anyone can see a difference. 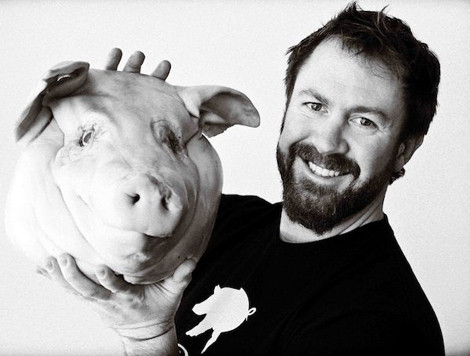 Today, we leave it to the head honcho of heritage-breed swine to debunk all the pork misinformation out there. Myth #1: You should only buy pork that is certified heritage breed. Lowe says: "Right now there is not a certification because it’s a breed. You buy a breed stock, then go home with your pigs and raise them, then market it; the chef community verifies when they buy it. "There is an organization that is working toward some sort of certification, but because it’s an animal, it’s hard. And it is still probably less than one-percent of the farming population that is passionate about farming around this philosophy. Otherwise, it’s still under wraps." The way that heritage-breed pigs are raised makes them more flavorful. Lowe says: “It’s like eating a plump, flavorful heirloom tomato right off the farm compared to the conventional red tomatoes in the grocery store that have almost no flavor. “You are what you eat. Any time you slow-grow, it takes more time and money, but a lot more flavor develops compared to commercially-bred pigs, which wash out all the traits [that make pigs taste better]." Okay, but pork is pork, right? Why heritage makes the whole hog matter. Myth #2: The best way to cook pork is medium-rare. There are other distinguishing factors between breeds besides just the flavor of the meat. Myth #3: You can tell whether pork is heritage-breed based on marbling. Lowe says: “Marbling is a strong characteristic and a good indicator that it will be a good cut of meat, but it doesn’t necessarily mean it is heritage breed. “Marbling is inter-muscular fat and it develops with age and based on what the pig was fed, as well as and the conditions in which it was raised. Fat gets into the muscle fibers over time. When you see marbling in a ribeye or a pork chop, you can tell it was raised over a longer period of time; you don’t get it with young animals like veal. And when you put fat onto a heat source, it turns to sugar, so you get a great rich flavor. "While not all heritage breed pigs have marbling, they all take on fat pretty well and therefore have a great deal of flavor." 1. If you’re planning to cook pork, start at the source: Seek a local butcher who is known for selling the whole animal, and whom you can have a conversation with about the origin and quality of the animal. 2. Identify it. Is it from a local farm? Is it a specific breed? There should be a farm or a name attached to it. 3. Be inspired and don’t overcook it. Page Myth #2: The best way to cook pork is medium-rare. Page Myth #3: You can tell whether pork is heritage-breed based on marbling.